Prepping For Black Friday #2 – Sale On Etsy Prints! As we approach Black Friday, Small Business Saturday and Cyber Monday, I have another post about my wares, this time with a big, fat, site-wide discount! Let me tell you a little bit about my prints. They are made at an extremely high-quality printer in downtown Los Angeles. My printer is not at all easy to get to; there is always traffic and I manage to get lost and the entire experience of getting there is terrible, but I wouldn’t change printers for the world. Even if I moved out of state, I’d keep using them and have them ship me my prints. 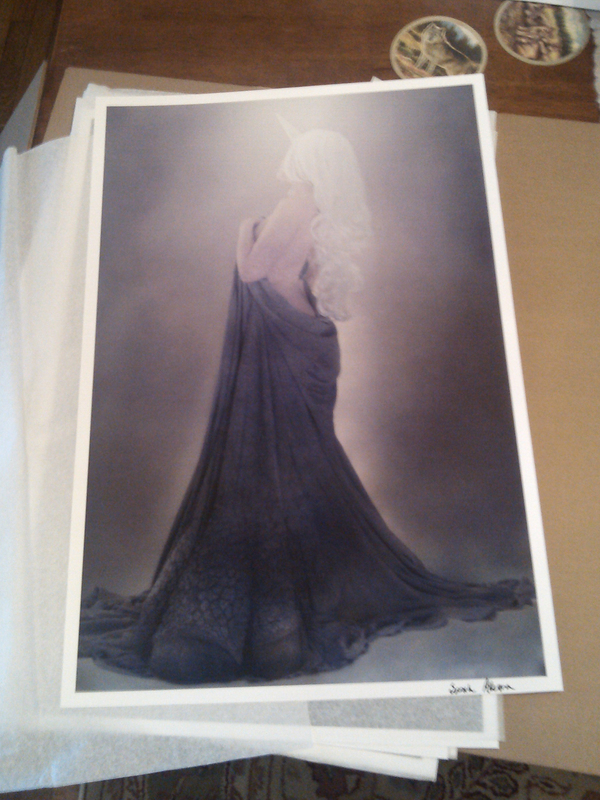 The incredible quality of the prints they deliver is just that high. Each and every image is carefully calibrated to reveal even the tiniest details. They somehow manage to keep the highlights high and the lowlights low without a single pixel’s worth of detail loss. The colors are an exact match for how I intend the images to look. These are NOT easy things! I have been through many printers before I found POV Evolving. And a special shout-out and thank you to Lauren, who always handles my orders! She is a delightful person and makes sure each and every image created is perfect. In addition to all that, they only use archival inks and paper, making prints that are museum-quality and which will last for a lifetime! The paper they use is this thick, luscious paper, almost like watercolor paper; nothing cheap or flimsy. Every single time I have an image printed, I’m impressed with how amazing it looks, even though I’ve been seeing how great they look for several years! 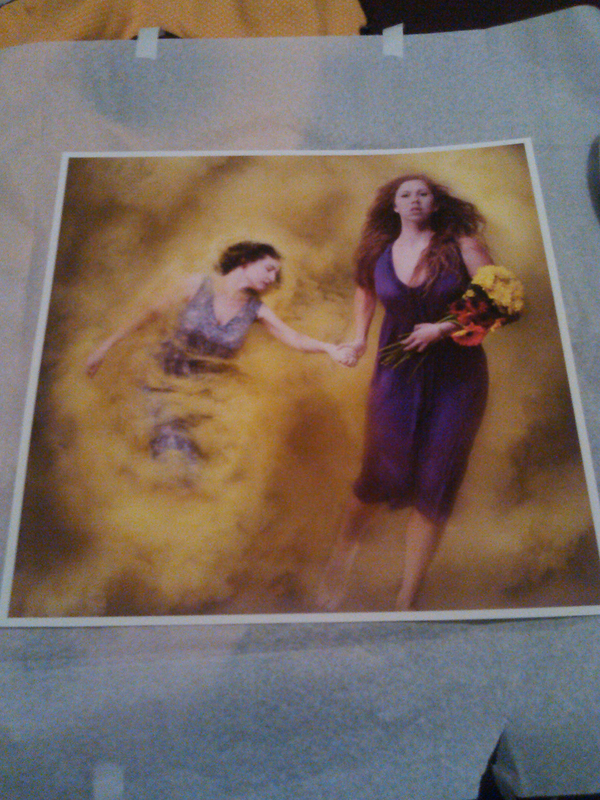 That means that there will only ever be 7 prints made of that particular image in that size, in the entire world, ever! Where Earth Meets The Sky – detail. 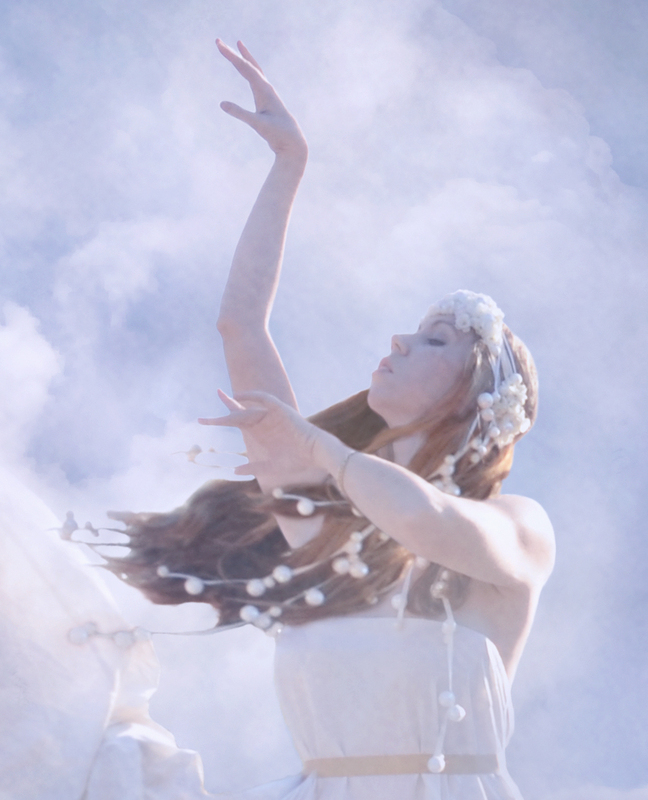 The Wind Goddess Headdress available on Etsy now! 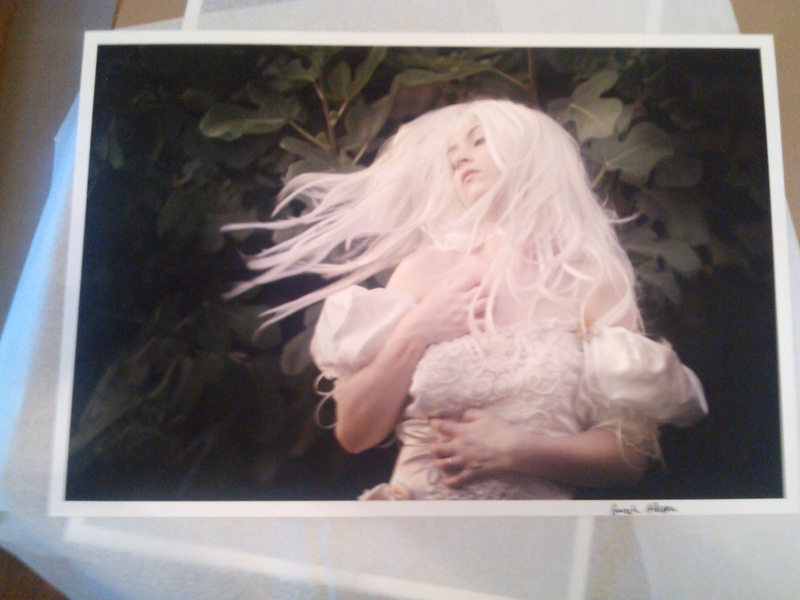 I also have a section of my shop dedicated to ME/CFS/fibro-inspired prints from my Enchanted Sleep series! 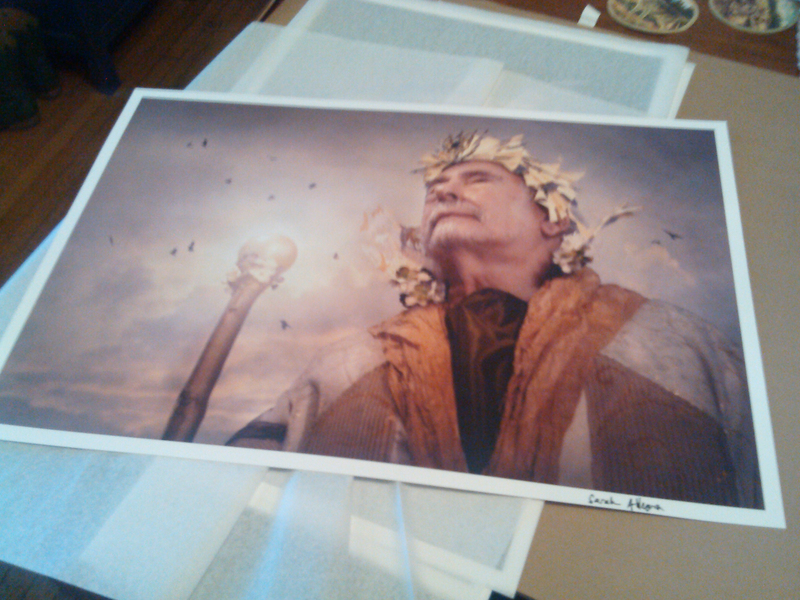 Each and every print will come signed and numbered along the white border. If you’d like a short, special message included, I’m happy to add that for you, free of charge! 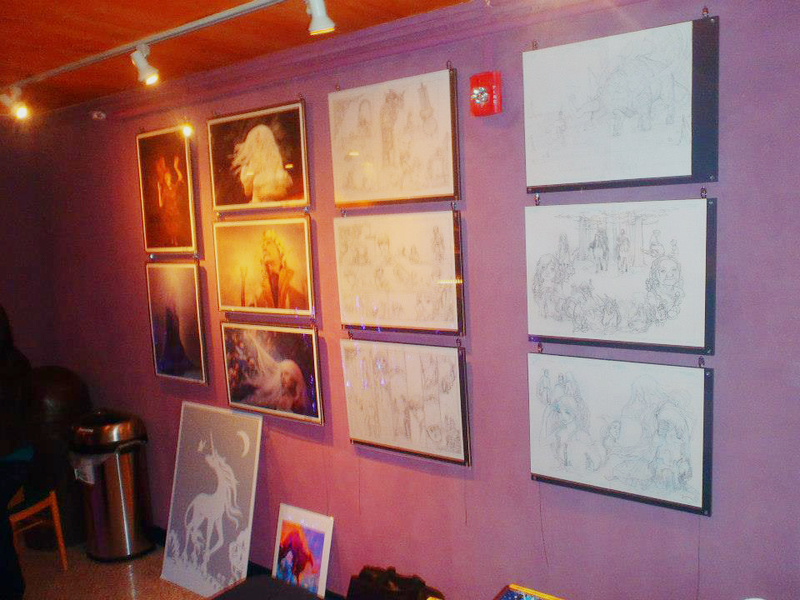 One more word about my prints; the quality of them was high enough that Peter S. Beagle himself took them along legs of his The Last Unicorn screening tour. 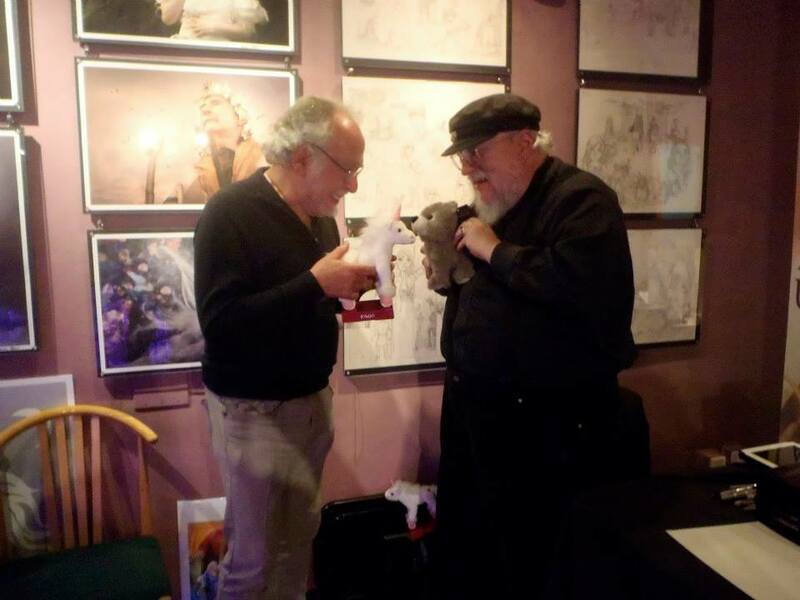 Peter S. Beagle and George RR Martin with plushies, in front of my prints! I’d like to say quickly that the above photo went a bit viral and I have been credited as the photographer, but I did not take this photo. I wasn’t even in the same state as they were at the time! I tweeted about the photo since it’s adorable and also in front of my prints, and then it really took off, but I did not snap the image, and though I have tried to correct news sources, they continue listing me as the photographer. So, I’m sorry to whoever did take this photo; I have tried to set the record straight! Take a look around my Etsy shop and don’t forget to use your discount code MYTHIC2014 to get 20% your entire order! Let me restate that this is the biggest, farthest-reaching sale I have ever had on my prints, so be sure to take advantage of it while it lasts! If there is a certain image you’d like a print of, or you see an image you like but want it in a different size, just let me know! Some of my images are under contract and I am unable to sell prints of them for that reason, but the majority of the time, I will be able to accommodate you very easily! Remember, the discount code is only good until January 31st 2015, so get ready, get set… go!! Happy shopping! The people spoke, and I have listened. 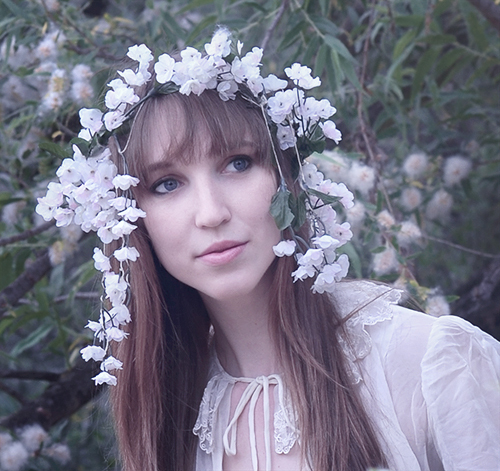 The Wind Goddess Headdress available on Etsy now!! 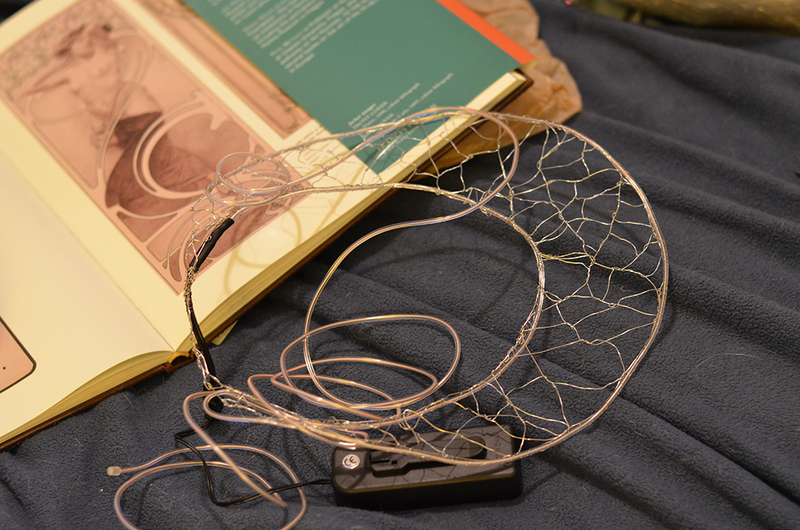 I made a replica of the headdress and put it in my Etsy shop. There’s only one at the moment, so if you must have it, grab it quickly, but more will be made if there’s a demand! That also goes for prints, by the way. It’s not cost- or time-effective to list every single print available in every single size on Etsy, so if there is an image would like a print of, again, just let me know! Is a loved one’s birthday coming up? Do you want a completely unique look for your wedding? 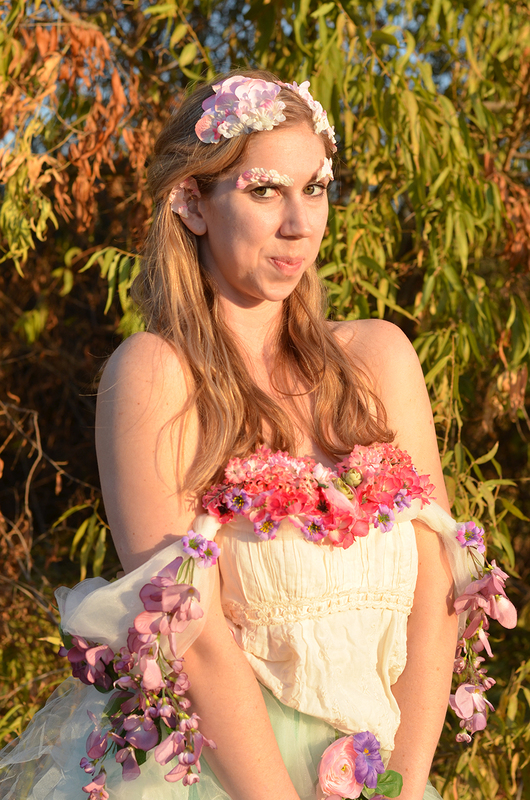 Is there a costume event coming up, or would you just love to wear it while you’re running errands? Poor, patient Katie shot this same concept with me three times, spanning almost a solid year from the first take to the last one. 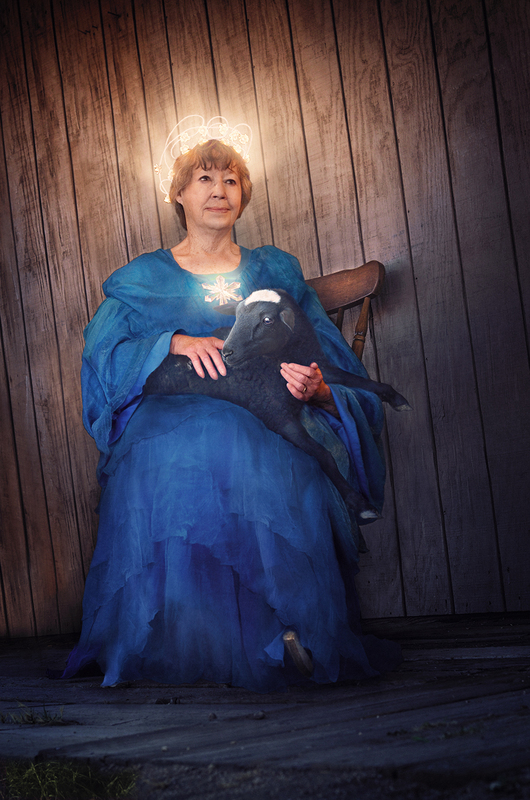 I assured her each time we reshot it that the problem was not her, because it honestly wasn’t. This was a case of me having a very clear vision in my head of how the image should look, but not taking the time to inspect it closely enough. Each of the other two tries at this shoot came close, but there was always something just enough wrong with it that I knew I needed to reshoot it to be truly happy with the final images. Here they finally are! 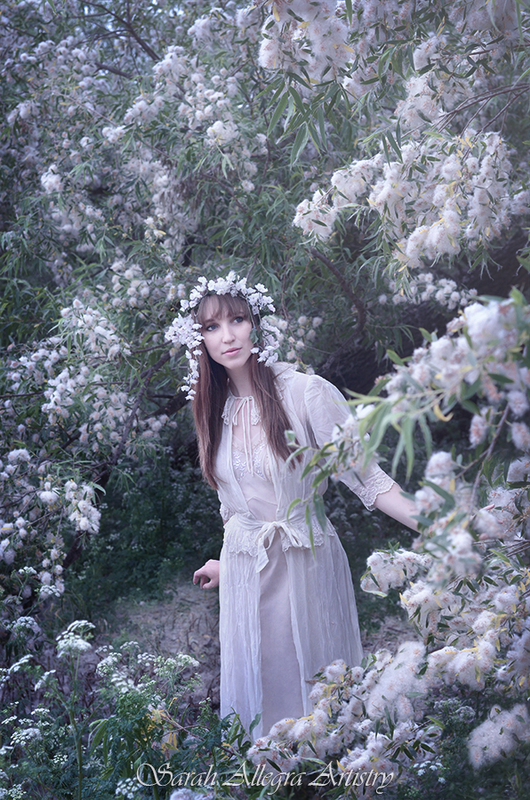 Flora is a DreamWorld character I’ve had in my head for a long time; an obvious statement given how many times I’ve tried to capture her visually, but much longer considering all the time I spent conceptualizing her and building her elaborate costume. When I was young, I watched (over and over and over) an animated version of The Lion, The Witch And The Wardrobe, which remains my favorite film version of the novel to this day (it’s the only version which, in my opinion, gives Aslan a truly “golden” voice as CS Lewis describes it, for one thing). In this take on the story, when Aslan is resurrected and romps with Lucy and Susan, flowers spring up wherever he steps, leaving a trail of paw-shaped floral clusters. Ok, so the idea wasn’t exactly mine. But at least I realized where I’d gotten the idea before I started calling it completely my own! I started with a beautifully embroidered corset top at a local second-hand store. I spent a while deciding if I would keep it as part of my personal wardrobe or use it for this costume, and the costume obviously won. I decided I had enough pretty things that I don’t wear often enough as is, and it really added a lovely depth to the costume with its subtle ornateness. The other base piece of clothing was a lovely, fluffy aqua-colored skirt made from layers of the lightest, softest netting. This was another thing I had to seriously debate weather to sacrifice to the costume gods, but in the end, I decided I could always buy another one for myself. 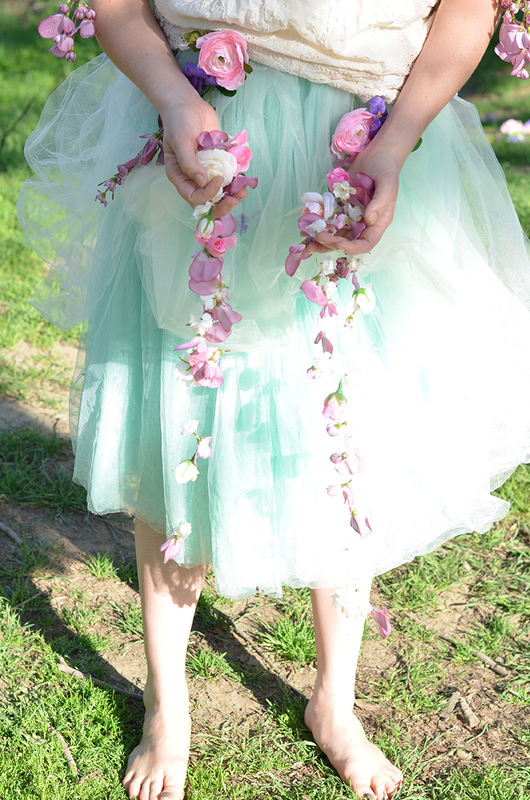 Over the aqua skirt, I added an airy overskirt of ivory tulle, lifting it in two spots at the front with a small spray of flowers to hold it in place. 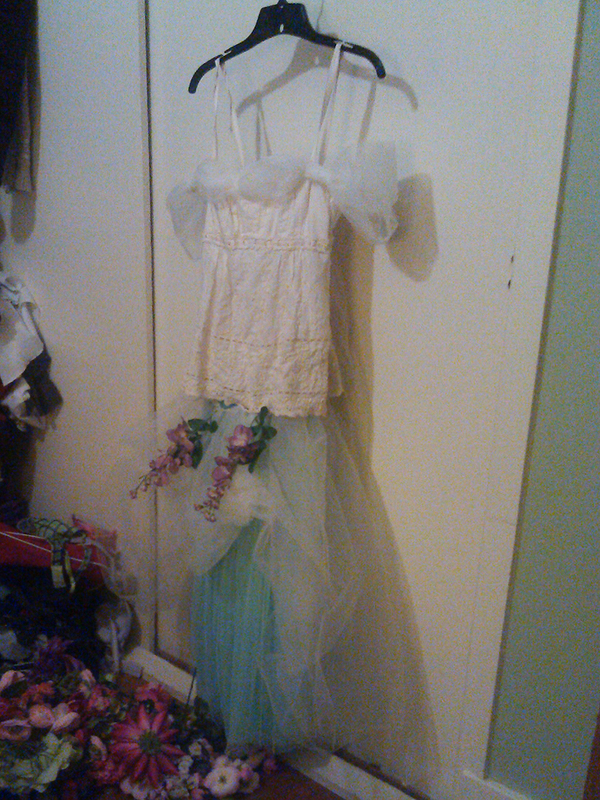 I added a layer of tulle around the top of the bodice as well to give flowers more to hold on to and also give it a dropped shoulder. Creating is usually a messy process. 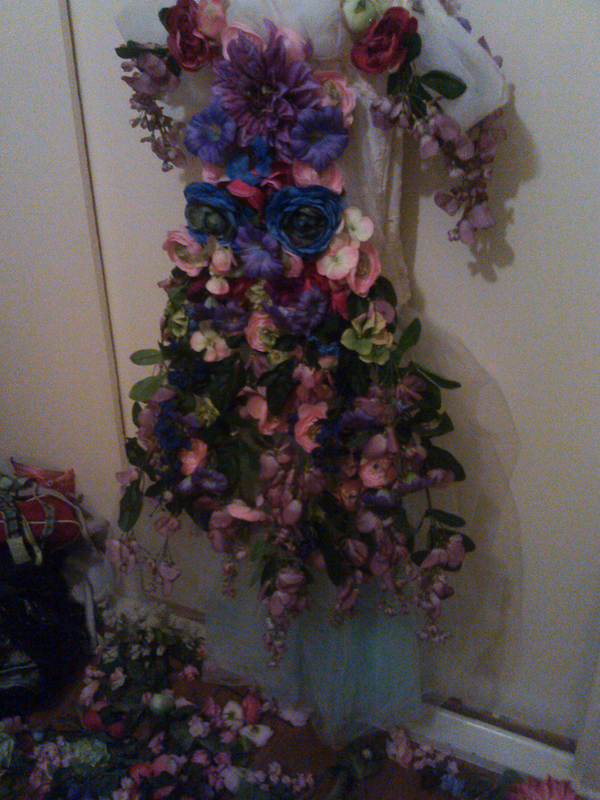 Next step, as it so often is, was to cover it with flowers! My handy hot glue gun proved its worth again. 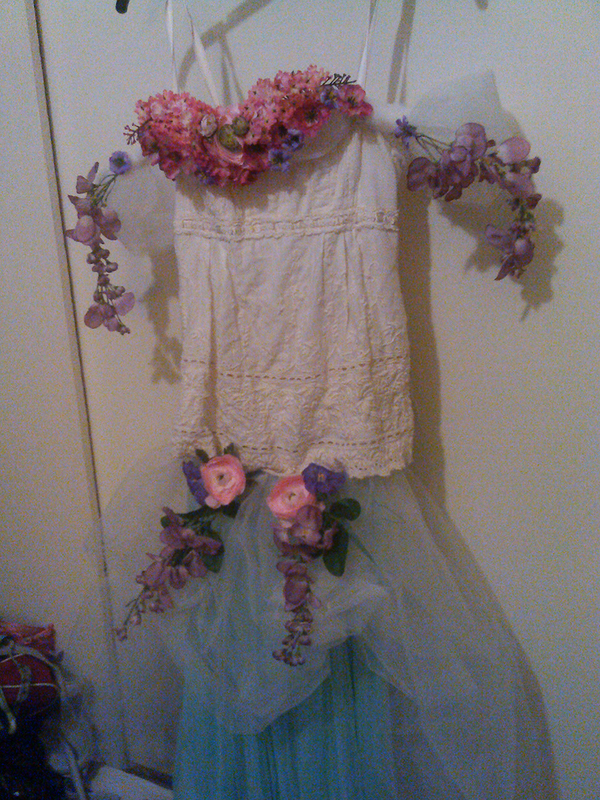 I tried to pick flowers which enhanced the shape I was creating in the clothing. 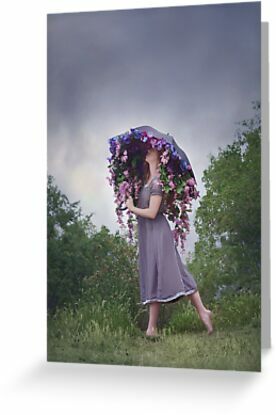 The wisteria dripping down from the shoulders seemed so perfect to me! Once I had the front looking pretty much like how I’d pictured it, I started working on the most exciting part; the train! This dress’ train started at the top of the back and went all the way down to the bottom of the skirt; a very old-fashioned and somewhat unusual style of train. 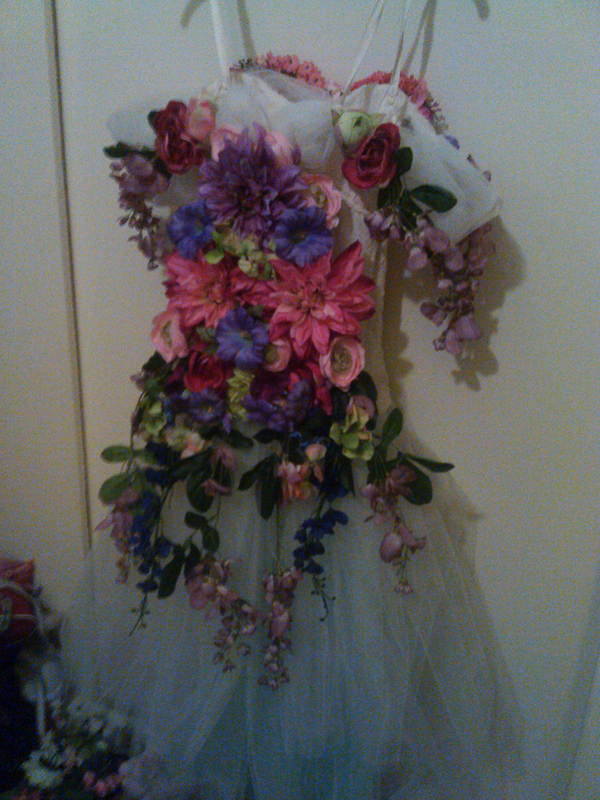 Since I knew I was going to have use my flowers carefully and wisely to make them cover everything I wanted them to, I hemmed and hawed over this part a lot; pinning flowers in place, moving them around, flipping this one and that one… Eventually I just had to start gluing flowers in place and trust that I would figure it out as I went. 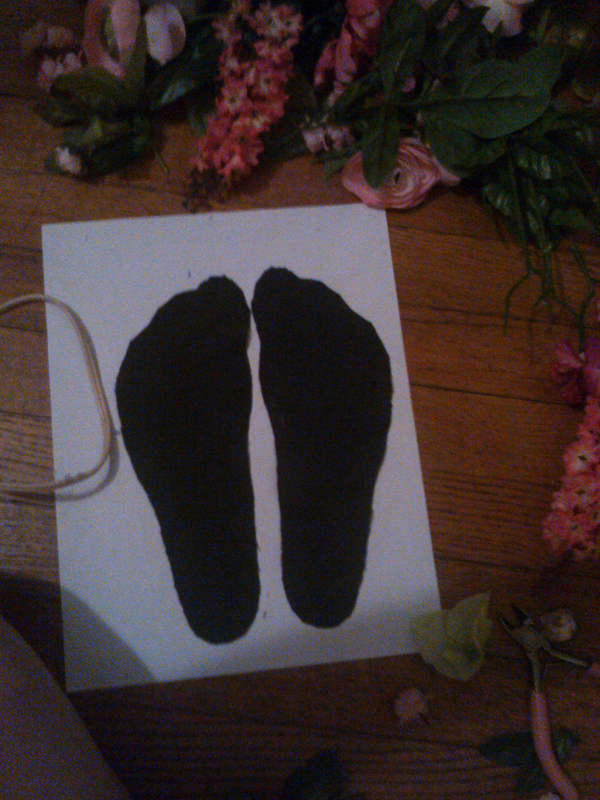 After I was satisfied with the dress, I started working on the flower footprints. I traced the shape of my feet onto paper and then cut four pairs of feet out of some nice dark green material I had leftover from another project. 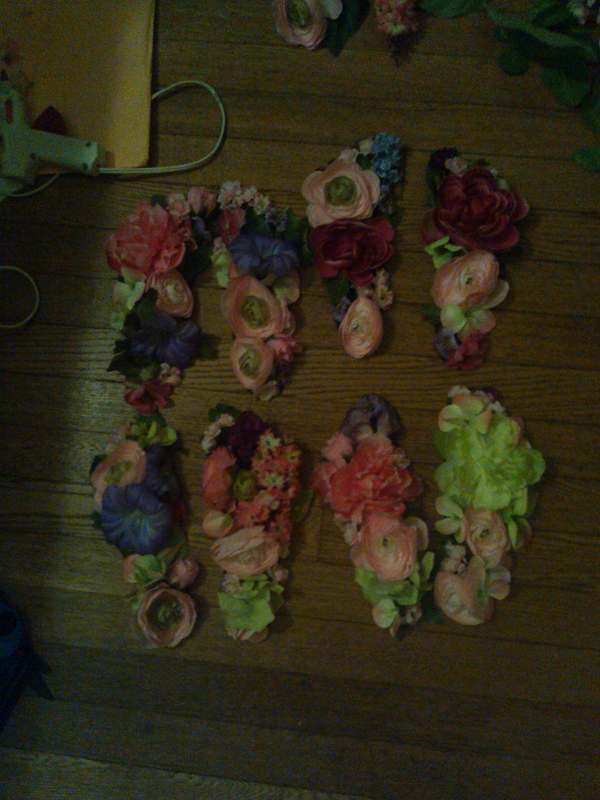 Again, the next step was to cover with flowers! This gave me a total of eight feet. 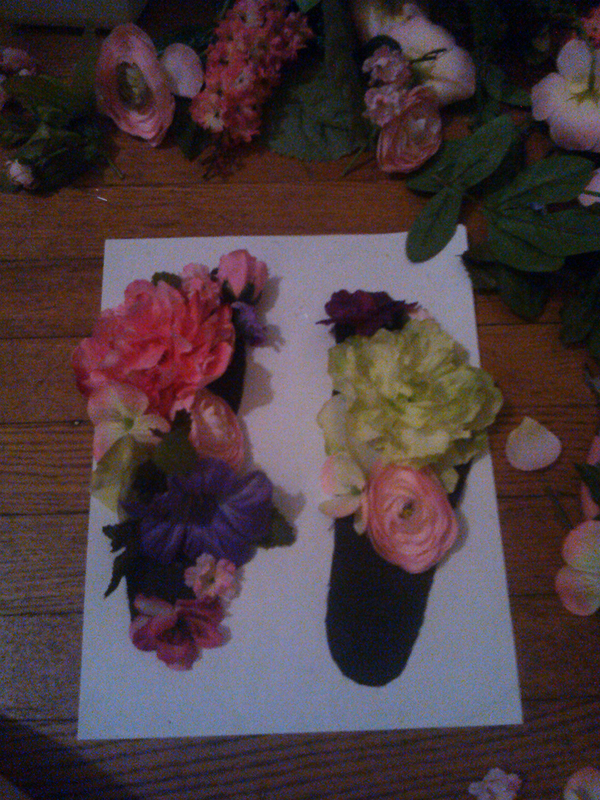 I would have liked to have done a few more, but I was running out of flowers, so I had to make due. Beware of hot glue drippings. I still have a faint scar from where this guy landed a year ago. 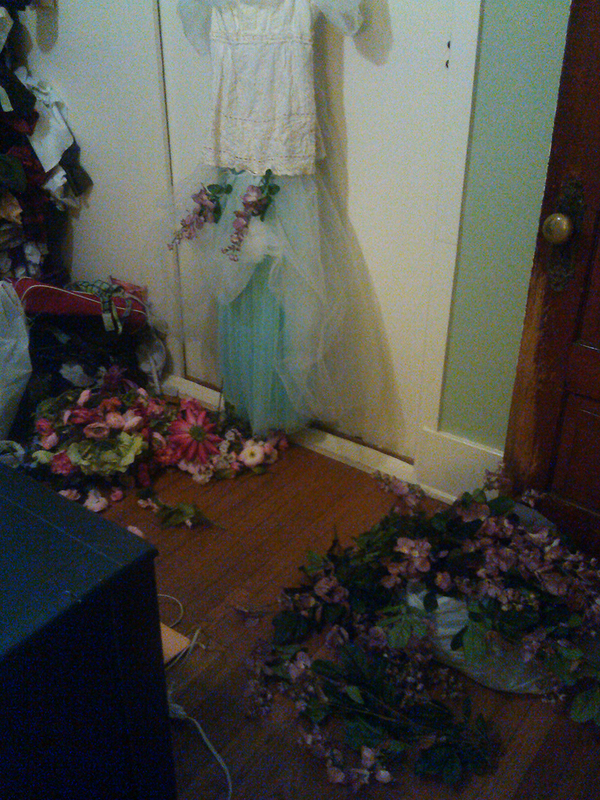 Apparently I didn’t take any making-of photos of the flower pieces for Katie’s face, hair and hands, which is too bad. For the pieces in her hair, on her eyebrows and ears, I cut rough shapes from a thin sheet of plastic; I knew the glue would melt the plastic where it came in direct contact, but it would provide just enough of a frame to make my life easier. They were very free-form creations, which I put together on my foam head to make sure the proportions were at least somewhat reasonable. I had planned on cutting them slightly to fit Katie’s face when the shooting day came, but they ended up fitting her beautifully! 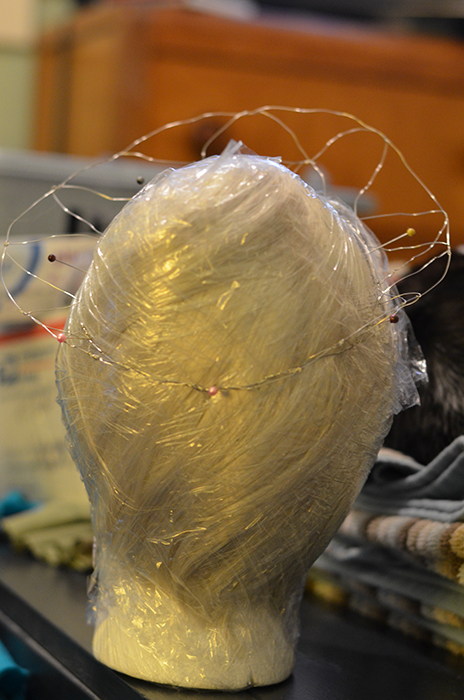 The pieces in her hair were held on with bobby pins and the ones of her face stayed on with a little help from garment tape. Katie being adorable and showing off her new prosthetics. Her “hand flowers,” as I was calling them, were meant to show life just springing off her, literally dripping from her fingers. These were only constructed the day before the third shoot, and I loved what they added to the images, so perhaps it’s lucky that the first two takes didn’t turn out 🙂 These were very, very easy to make. I tied a loop of clear, stretchy cord to slide over Katie’s palms. From each of these loops I tied three lengths of monofilament thread and randomly glued little petals and blossoms to them so it looked like they were falling. At this point Katie and I shot the concept… then we reshot it… and then we finally shot it for a third time, which was the one that stuck. It goes to show, if something doesn’t go right the first time, just try and use it as a learning experience! With Katie, we always have a fun time, no matter what we shoot, so when concepts aren’t perfect right away, I haven’t wasted anything. I had a good time with my friend, and I hopefully learned something about how I don’t want my final image to look! With that said, allow me to show you the finished trio of images, with detail shots beneath each of them! And here’s a few more detail shots to cover all my bases! If you have a favorite of the three, I’d love to hear your opinion! Thank you, PhotoFocus!! And thank you to all my readers and supporters! And an extra big, special thank you to Katie Johnson for being so patient and willing to keep redoing this one concept with me and knocking it out of the park every time! My dear friend and frequent collaborator Katie Johnson has recently started a new video series which profiles the artists she works with frequently. I was honored to be featured in the first of her videos! She put a great piece together which includes an interview with me and lots of behind-the-scenes peeks into how we work. “The prison of my person, the shackles of my skin” perfectly describes how I feel about my physical body most days. Though I doubt Mr. Beagle had ME in mind when he wrote it, it resonates so strongly with me. And I’m sure people with other chronic illnesses will be able to identify with it; it’s a pretty universal problem across the chronically ill spectrum. 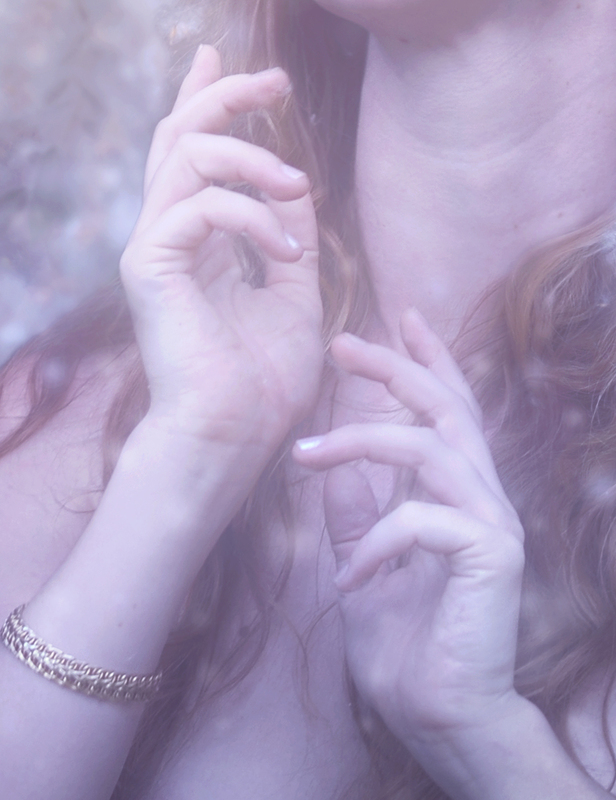 Feeling so trapped has always made me instantly know something of what Amalthea felt at finding herself in human form. I imagine it was even harder for her though. The disharmony we chronically ill feel with our body was something I’d wanted to express in my Enchanted Sleep series for quite a while and I was glad to finally bring the image to life! There’s something more visceral about images than you often can’t replicate with words. Words are powerful, they can build and tear down mountains, but the visual world offers the same information in a different form. One that, if used well, can strike like a snake and bring instantaneous understanding. That’s my hope with this series; to illustrate the life of a person with myalgic encephalomyelitis in a way that reaches where words cannot. 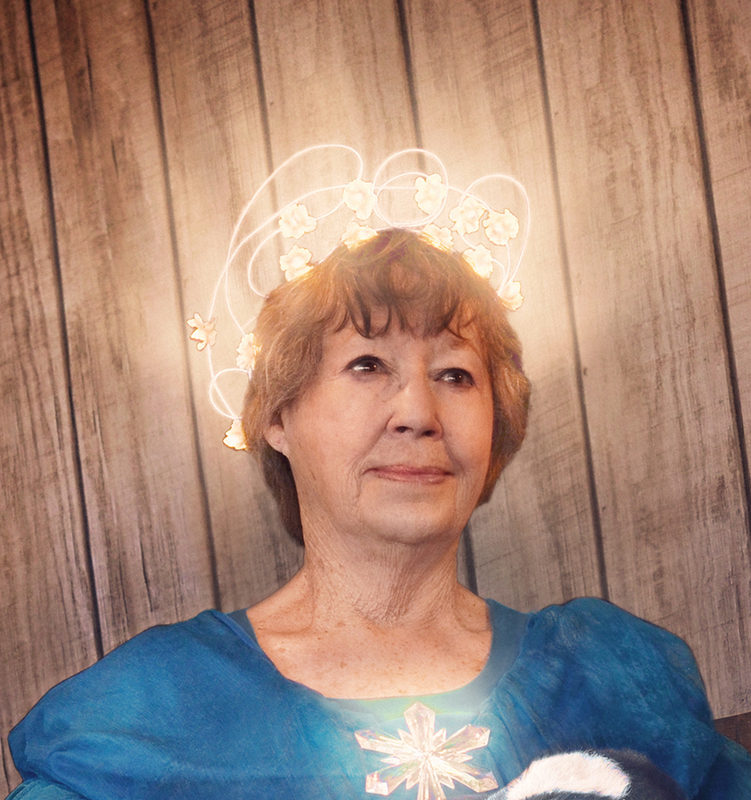 To give credit where it’s due, I have to say that I originally got the idea to shoot my grandmother for DreamWorld from Ashley Lebedev’s beautiful portrait of her grandmother. It immediately struck a chord with me, and I began brainstorming concepts for my grandmother right away. My grandfather tragically died quite suddenly of a heart attack when I was 17. He was the love of her life… and really, the love of everyone who he came into contact with. He was a truly remarkable man, and I will tell you more about him one day when I finally get the photo honoring his memory shot in a way that I’m satisfied with. But for now we can say that he was extraordinary, and everyone was shaken by his loss, most of all my grandmother. 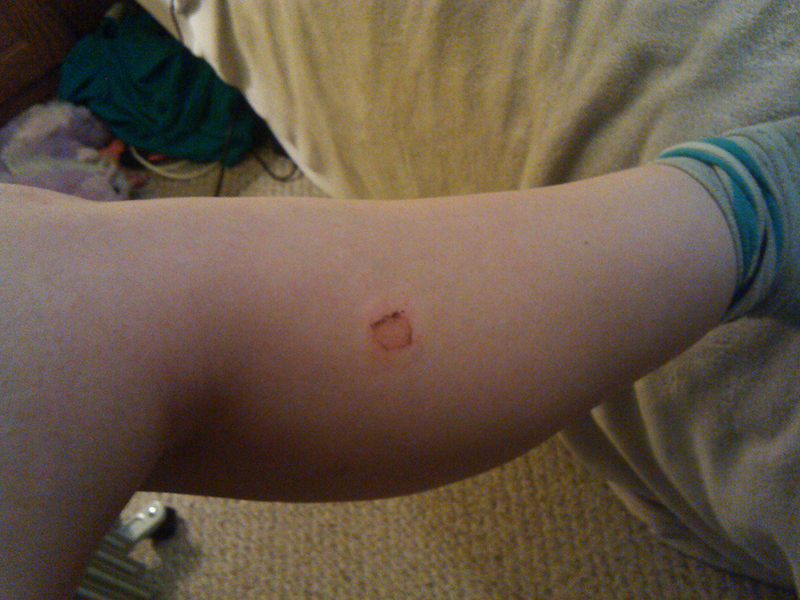 I can only imagine how incredibly difficult and painful that must have been. But Gramma handled it with such grace and strength, I was deeply impressed, even at my young age. She delivered a celebratory and wonderful eulogy at his memorial which left everyone smiling through their tears. And since then, though we all miss him greatly, his memory has been kept alive in a spirit of appreciation and love. After my grandfather’s death, Gramma became even more involved with her church and eventually became a deaconess! For many years she helped lead a support group for those who had lost loved ones, something she could draw on her own experiences of her path to healing and let others know that it was possible to get through, no matter how dark it looked at the time. So when I sat down to figure out what I wanted her photo to be like, I tried to distill Gramma’s essence into a single image. I saw her as a gentle leader, always leading by example, indescribably warm and accepting, looking for the best in people, and of course someone who is quite spiritual as well. It seemed like a shepherdess would be the best way to portray all of these qualities. I especially wanted to play up her radiating light in a world that is often dark, so I began to think of ways I could show that as well. A crown of light, I eventually decided, would be just perfect. So, now to build a crown of light. After Googling a lot, I discovered electroluminescent (EL) wire! It’s wire that comes in a wide range of sizes and colors and every bit of it glows. It’s not just a string of LEDs in a plastic tube, this stuff actually produces solid light all on its own with a handy little battery pack. Perfect! I ordered some and eagerly waited for it to arrive. I wanted to give it a little bit of an art nouveau flavor, since that’s one of my favorite visual styles. 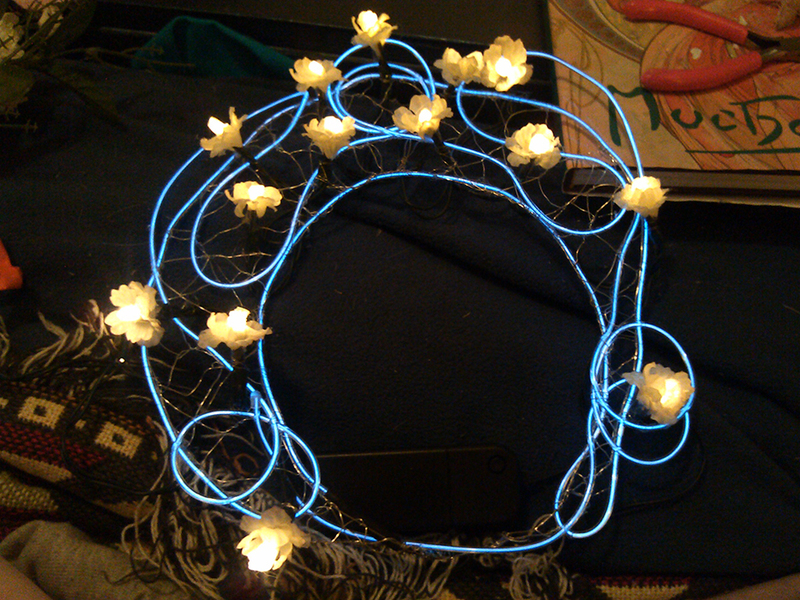 I started building a light wire frame, enforcing it as I went. 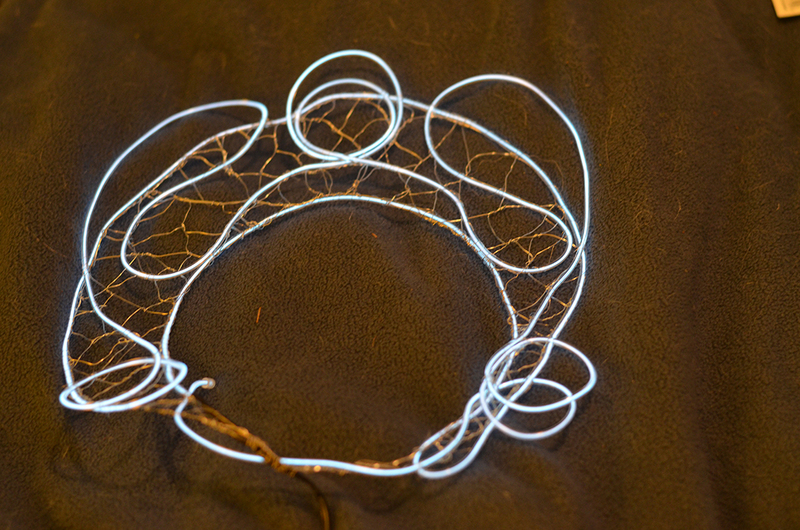 After I had the frame fairly sturdy, I started adding in nouveau-like swirls with the EL wire. You can see one of my Mucha books under the crown for inspiration as I went along. Ok! It was a little rough, but the general shape was there and it definitely glowed! 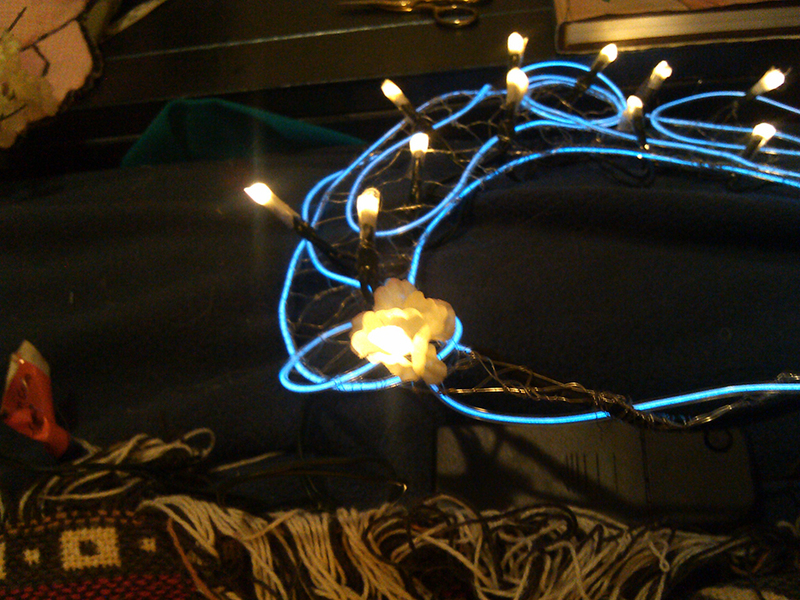 At that point I strung along some very small, light, and also battery-powered LEDs, which I would encase in a small flower. You can see one here covered with a flower while the rest are bare. The finished crown! 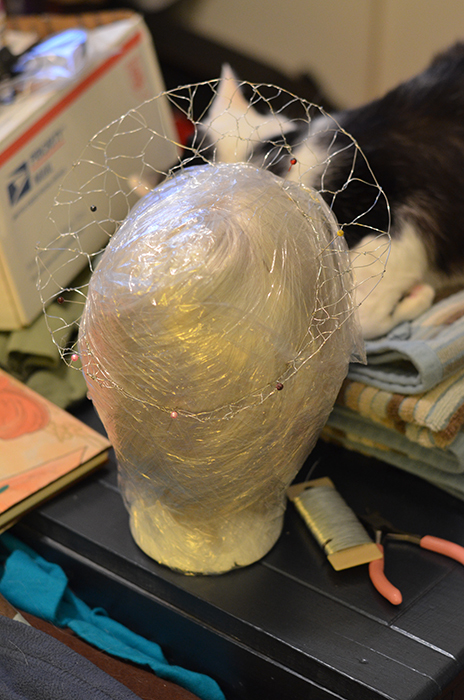 I knew I’d be doing some adjusting of it once I actually saw it on Gramma’s head, so I didn’t worry about making it 100% perfect right then, but the bones were all laid. Now there was the problem of finding a lamb…. Google again came to my rescue by connecting me with Terry from Task Farms. Terry is just a sweetheart of a man. He runs the farm just out of the pure pleasure of it and has lots of sheep and goats. None of the animals end up on anyone’s dinner plate, which made it an even more perfect place to shoot! I ended up getting several photos taken that day, but you’ll hear more about the farm in detail when I get the rest of the images worked up. 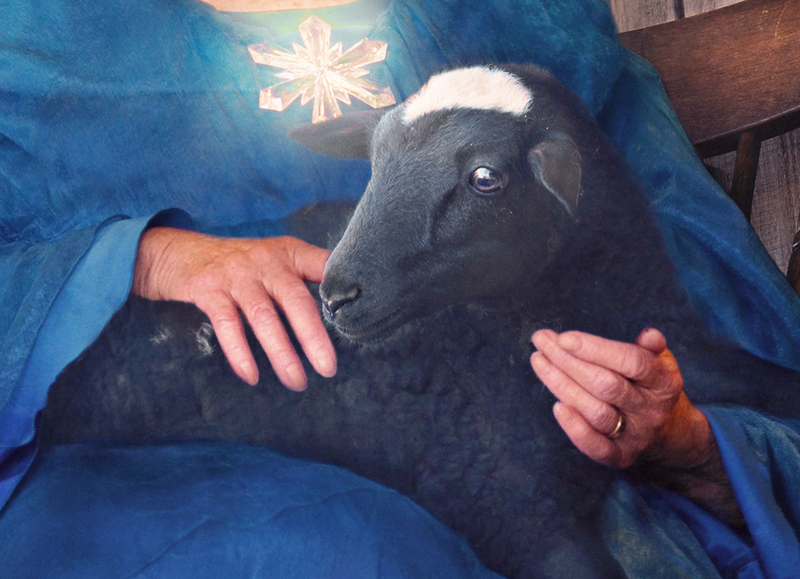 As it happened, he had an adorable and very silly little lamb named Too Cute who was just perfect. Task Farms is out near Palmdale, which is a bit of a drive from here, so Katie, Brooke, Meredith (who wanted to take behind-the-scenes photos) and I all drove out together. I had Katie put on the costume Gramma would be wearing, chose a neutral location and let Katie be Gramma’s stand-in. 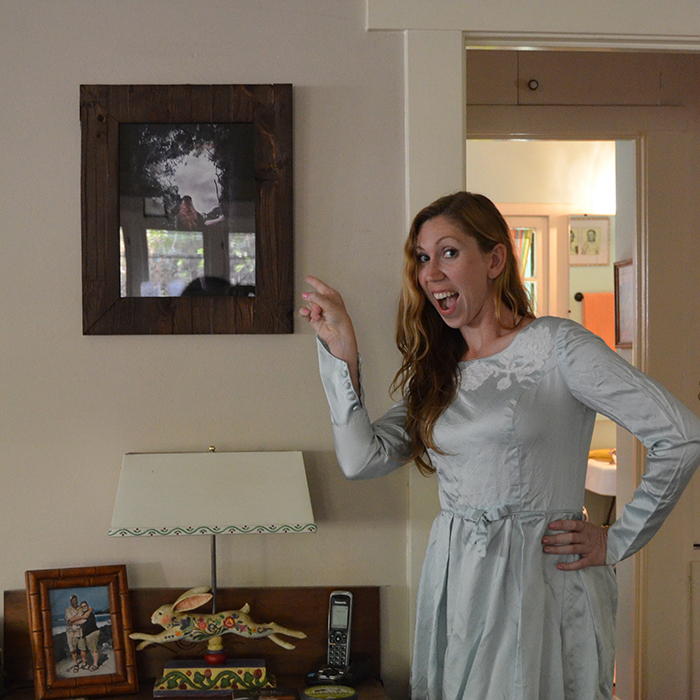 Thanks to Meredith for coming along and taking great behind-the-scenes photos like these! So what do these photos convey to me? They show my grandmother being the strong, gentle, and completely loving woman that she is. She is a ray of light in darkness, someone who always lifts you up, cares for you and supports you. She has been one of the most supportive people in my life when it comes to my art, always encouraging me and loving what I do… and I sincerely think it’s not just because she’s my grandmother and she has to like whatever I do, but because she genuinely believes in me and loves what I do. So please meet my grandmother, Lucea, a truly wonderful and remarkable woman who I am so thankful to have in my life, and to have had the chance to photograph her! One of the unexpected perks of being a photographer who often shoots in natural settings is that I have been able to witness some examples of incredible beauty and wonder that I never would have seen if I wasn’t out in it so frequently. One example of this is the sudden winter that fell over a nearby forest in the middle of summer. 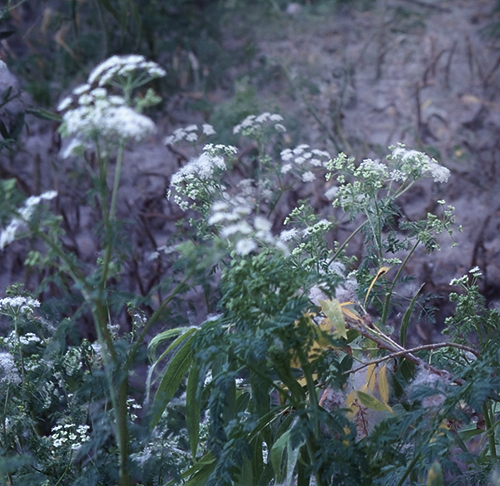 The forest is rich with a certain kind of tree which apparently reproduces in much the same way a dandelions does; growing a downy, fluffy seed which the wind carries far and wide. 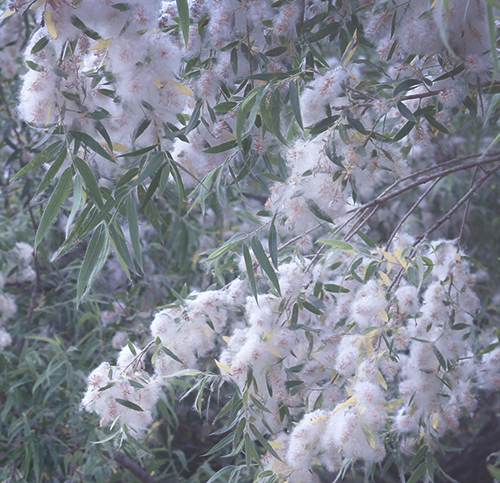 I have searched and searched, but I still have no idea what the name of the tree is; if you know, please tell me! 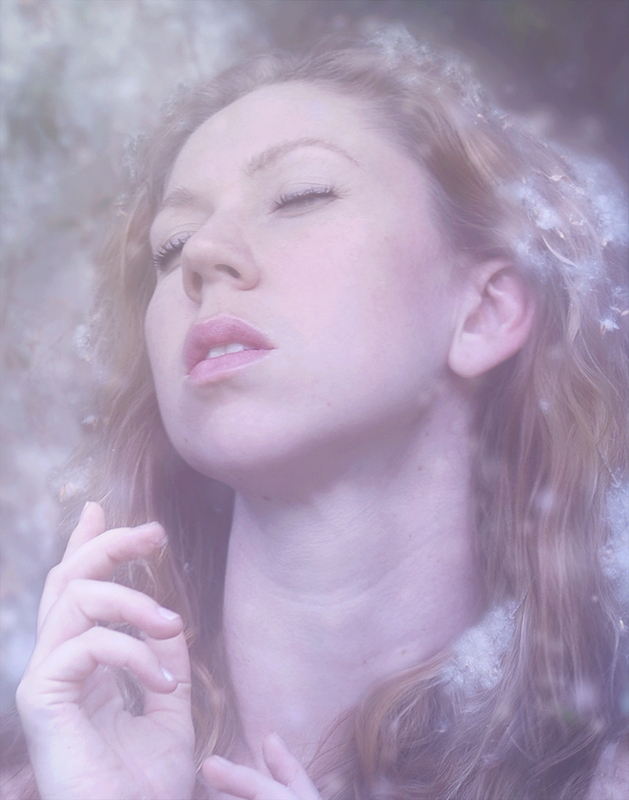 Regardless, the result of the trees was that huge sections of the forest was covered in a magical “snow.” I couldn’t have asked for a setting more perfect for DreamWorld. Naturally, I leaped into photographic action. The first photo of the series featured Dedeker amidst the snow trees. 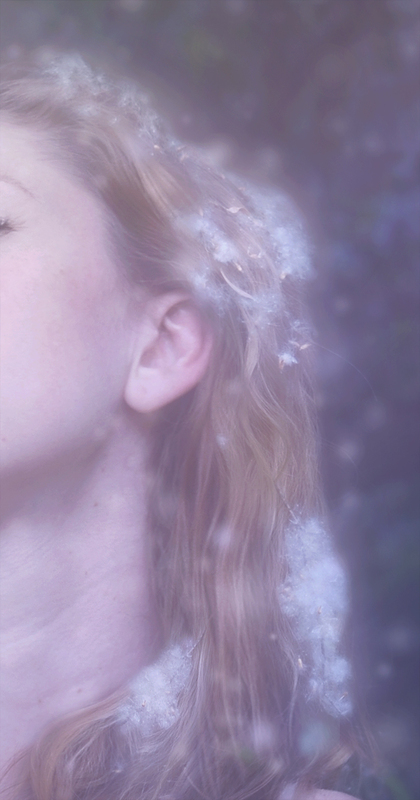 She carried such a feeling of wonder and awe, much the same as I had felt the first time I saw the snowy landscape. The second photo I created was with Katie. I decided there should be someone who ruled this forever-winter corner of DreamWorld, a benevolent being who would keep things always winter, but it would be a spring-like winter full of life and growth. I’m sure a lot of my fascination with this idea has to do with the brutal Los Angeles summer we all go through every year, and the fact that heat makes all of my symptoms much worse. I dread summer every year, and I long for a place where summer could never reach, so the Snow Saint was created. 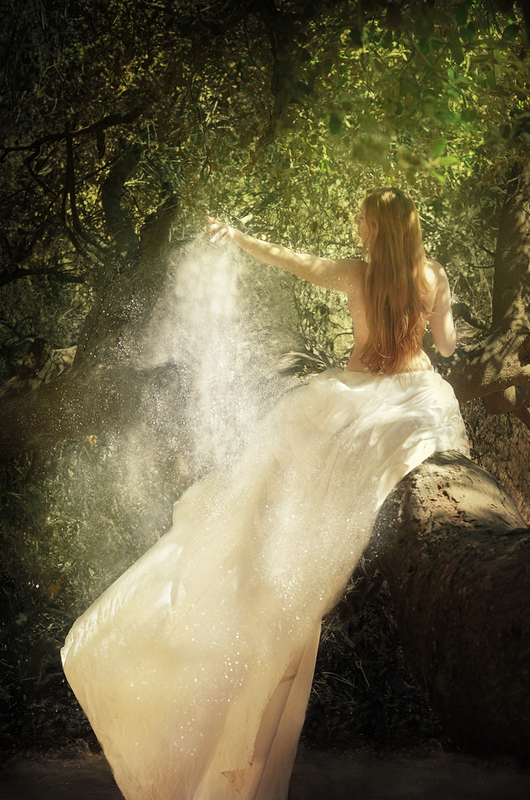 I wanted her to have a semi-religious quality, something that hinted at a spirituality as well as power over nature. Katie easily embodied all of these elements at once. The Snow Saint looks like a queen, like someone to be revered, but also someone you could approach and who would hear your supplications.